Postal Worker CGI’s Win Free Insurance Promotion Most Recent Winner – PVH Group Inc. THE WINNINGS are flowing like proverbial water at CGI as more Barbadians continue to win free insurance for a year. The most recent winner is Philip Cain, a postal worker who had never won anything before but decided to enter the competition via social media last December. Cain won free home insurance, and just in time too. “I had just finished building my home, so I was looking to insure it,” said the postman of 32 years’ experience. It was while surfing the Internet that Cain, who normally does business with another insurance company, saw CGI’s competition online. He entered his name and details, and received a call in January informing him of his win. “I have never won anything in my life. I always have to buy,” he said just before accepting his prize at CGI’s Warrens headquarters a few days later. From now onward, says the St. John father, he will be a loyal CGI customer. 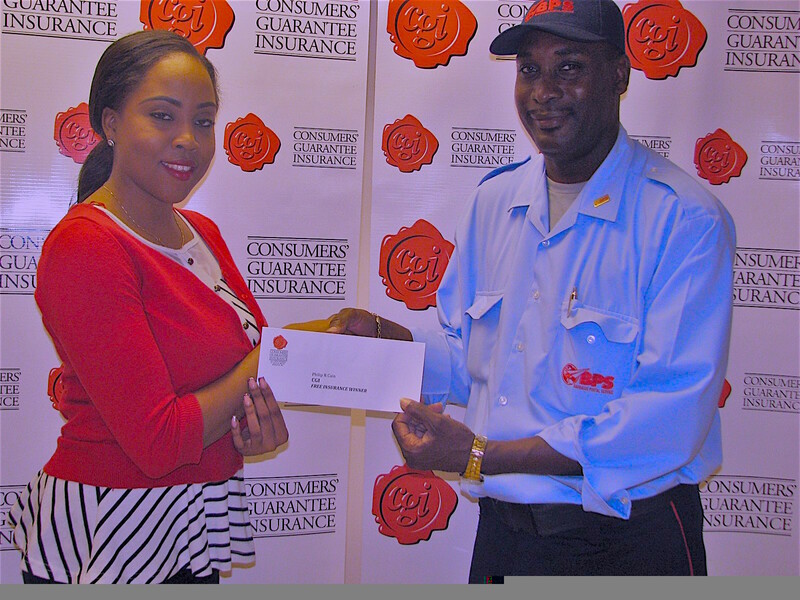 Caption: Winner Philip Cain receiving his prize of free home insurance for a year from Karla Yearwood, CGI’s customer service representative (marketing).